String Trimmer Spool Winder for Ryobi Trimmers #3DPrinting #3DThursday « Adafruit Industries – Makers, hackers, artists, designers and engineers! rcolyer shared this project on Thingiverse! 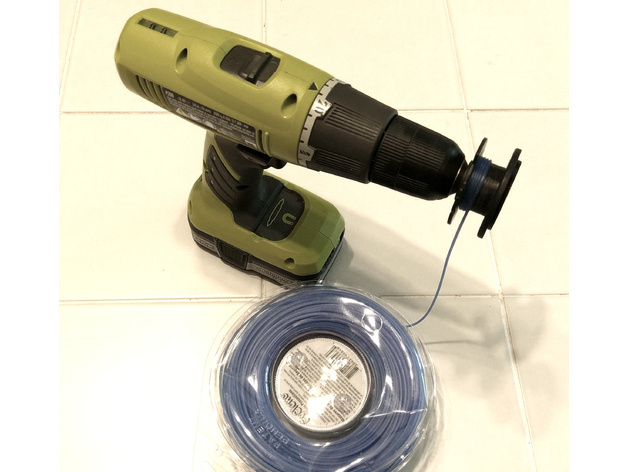 This is an adapter for Ryobi string trimmer spools to allow you to efficiently wind them from bulk spools using a drill. Simply slide the winder through the hole in the spool, click it into place, and then grasp the protruding part in the drill chuck. From there, SLOWLY wind the filament onto the spool at a controlled pace. This allows rewinding a spool in short time and with little effort. There are two sizes provided, with 15 teeth and 7 teeth. It seems Ryobi switched the tooth count to 7 at some point to make the trimmer line advance faster. Look on your spool and count the teeth to see which version you need. If they change it again, this works in Customizer. WARNING NOTE: Drills are power tools, and string trimmer line is designed to cut things when it goes fast. Attempt this at your own risk and only if you are familiar with safe usage of power tools. A variable speed drill is essential.